Poor water quality is a major cause of stress in turtles & terrapins. A build-up of organic compounds (turtle & terrapin waste, uneaten food & plant debris) promotes the growth of disease causing organisms in the tank or terrarium. This can be avoided by having a filter installed. As well as physically removing particles from the water, the filter also houses nitrifying bacteria, which convert the dangerous ammonia and nitrite into nitrate. The removal of these substances by bacteria is know as the 'Biological Filter', and is essential for a healthy, balanced tank or terrarium. 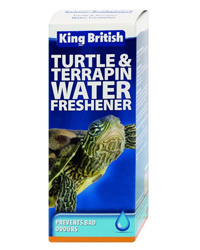 Turtle & Terrapin Water Freshener contains five natural types of bacteria that neutralise & digest organic waste produced by turtles & terrapins and rapidly eliminates the bad odours that can build up when turtles & terrapins are kept in tanks & terrariums.